Crissy dolls let you change their hair length, Blythe dolls let you change their eye color. And then along came Tiffany (the big one) and Tuesday (the Barbie-sized one) Taylor, who let you change her hair color. I loved Tuesday, but she was an odd duck. In addition to the hair that you could turn halfway around, her hands popped off at the wrist. 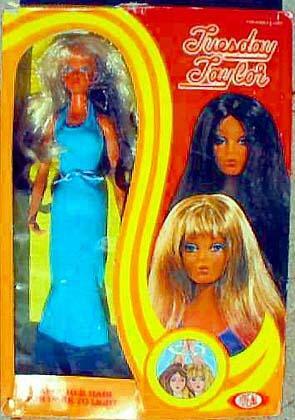 So really, if you wanted a Barbie-style doll to be tortured in kidnapping and other scenarios, she was perfect. The hair thing was weird, but it was also really cool. If you liked Charlie's Angels but couldn't decide if Kelly or Jill was your favorite angel, you could switch back and forth with impunity. And she had some super-sweet TV commercials, too. A young Brooke Shields is in this second one!